In a rare midterm election in which foreign policy was a major issue, it is not too much of a stretch to say that American voters put U.N. Ambassador John Bolton out of office. Bolton's resignation from his unconfirmed recess appointment at the U.N. removes the residual fear that the Bush team had something up its sleeve to bypass senatorial resistance to his confirmation. The White House had claimed the support of a bipartisan silent majority for his appointment — even though it was vociferous defections from GOP ranks that helped thwart his confirmation. In fact, Bolton's determination to hang on up to this point suggests that his obsession with the United Nations is as serious as Ted Haggard's with sin: He just can't keep away from it. For three decades of work at conservative think tanks and at the State Department, Bolton has angled for appointments that would in some way keep him grappling at close quarters with the organization even if they sometimes involved him in contradictory positions. Even when the Bushes were out of office, Bolton filled in his time working with former Secretary of State James Baker when he was appointed U.N. special envoy for the Western Sahara. The Moroccan annexation of the territory has been on the U.N. agenda for more than 30 years and a standing invitation to complaints about the organization's ineffectiveness; Bolton has been remarkably reticent to highlight it. Bolton's other job in exile was to advise the Taiwanese government on how to get into an organization that he had spent decades advising the United States to get out of. No sooner had he arrived at the U.N. in 2005 than he cooked up a deal with Beijing's ambassador to scuttle the efforts of Germany, Japan and India — all US allies — to get permanent seats on the Security Council. He may have had a point about the undesirability of the changes — but a more diplomatic envoy would not have left American fingerprints so messily obvious. From the White House point of view, Bolton's appointment appeased the know-nothing foreign policy crowd while rewarding his longstanding loyalty to the Bush dynasty. That loyalty had been shown most memorably in 2000, when the man who has spent the past year preaching democracy to the members of the United Nations strode into a library polling place in Florida yelling, "I'm with the Bush-Cheney team, and I'm here to stop the count." To be fair, while Bolton's tenure has from the standpoint of any rational diplomacy been a disaster, it has not been an unmitigated one. He has been a very well-trained attack dog, always coming to heel when the White House wanted and chewing his own words when necessary. One of his proudest achievements in his previous job at the State Department was to "unsign" the treaty that committed the United States to the International Criminal Court, and then to bully and browbeat small countries across the world into signing agreements not to extradite U.S. citizens to its seat in The Hague. And then this year he had to allow a Security Council resolution setting the Court's prosecutors on the perpetrators in Darfur. As pious commentators talk about how effective he was, it is worth remembering that while he was in charge of arms control, North Korea joined the nuclear club and that, according to him and Bolton and his allies, Iran is about to. It is an achievement — but of a dubious sort for an alleged arms control maestro. To be fair, within the Administration, he reportedly opposed the U.S.-Indian nuclear deal, although he remained silent on Israeli nuclear capabilities. Otherwise, Bolton's most memorable "achievement" occurred while he was in charge of arms control at the State Department before moving to the U.N. He was a major saboteur of Congressional efforts to improve and tighten the Nuclear Non-Proliferation Treaty. If these measures had been passed, countries would not have been able, as North Korea did, to drop out of the treaty after reaping its dual-use benefits, and the voluntary protocols on inspection that Iran stopped observing would have been compulsory. However, his greatest legacy may be his semi-successful attempt to wreck the U.N. reform proposals last year. By introducing hundreds of unilateral amendments after long months of painstaking negotiations between the members, he certainly managed to destroy the efforts of Kofi Annan to persuade the Third World members that managerial reforms were not some form of American and Western plot. In fact, almost every public statement he made pretty much confirmed their suspicions. Bolton leaves unfinished business at the U.N. His attempt to enforce on Iran an international law in which he professes disbelief comes to nothing as Security Council members try to insure that Washington has no excuse to take military action. The resolution is stalemated and diluted. Although he is now implying personal credit for the appointment of Ban Ki-moon, the incoming Secretary General, Ban is astute enough to know that he was far from Washington's first choice for the position. 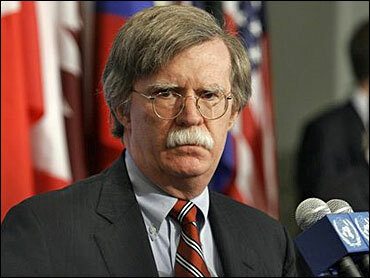 Ban differed from Bolton on issues ranging from the International Criminal Court to how to deal with Pyongyang. Bolton has clearly relished his role at the U.N., and one nightmare scenario would be intense White House pressure on Ban to grant him a senior U.N. appointment. If that sounds farfetched, just consider the recent appointment of Bush supporter and former Washington Times editor Josette Sheeran Shiner as head of the World Food Program. One cannot help but suspect that Minnesota Senator Norm Coleman will soon have competition in xenophobic grandstanding. Bolton's media prominence, his longstanding credentials as a Goldwater supporter and his newly acquired status as a martyr for conservatism would certainly equip him for a political career in the GOP's new confederate heartland, where tough talk regularly obscures lack of achievement.